Henry Stafford, 2nd Duke of Buckingham. Henry Stafford was born on 4 September 1455, the son of Humphrey Stafford, Earl of Stafford, and Margaret Beaufort. His father, Humphrey Stafford had been a Lancstrian supporter in the early stages of the Wars of the Roses and had died in 1458 of wounds acquired at the First Battle of St Albans, whilst fighting for the cause of King Henry VI . Henry inherited the title of Duke of Buckingham from his paternal grandfather, Humphrey Stafford, 1st Duke of Buckingham, another staunch Lancastrian, who was killed at the Battle of Northampton on 10 July 1460. The Yorkist King Edward IV made the young Henry, then aged four, a ward of his Queen, Elizabeth Woodville, who married him, while still a child, to her sister Catherine Woodville. Buckingham and his wife were then brought up in the Queen's household, apart from the exception of the brief Lancastrian readeption of 1470-71, when he lived with his grandmother. When Edward IV returned from exile to regain the throne, Buckingham was with him after the Yorkist victories at Barnet and Tewksbury and was given a number of posts in reward for his loyalty. However,Buckingham grew to strongly resent his wife and the Woodville family in general and considered he had married beneath him. Henry Staford was closely related to the royal house, three of his grandparents were descended from King Edward III. His paternal grandfather, Humphrey Stafford, 1st Duke of Buckingham, was the son of Anne of Gloucester, daughter of Thomas of Woodstock, 1st Duke of Gloucester and the youngest son of King Edward III. Buckingham's paternal grandmother was Anne Neville, the daughter of Joan Beaufort, Countess of Westmorland, a granddaughter of Edward III, through his third son John of Gaunt, Duke of Lancaster. His maternal grandfather was Edmund Beaufort, 2nd Duke of Somerset, the son of John Beaufort, 1st Earl of Somerset and Joan Beaufort's brother. On the death of Edward IV in 1483, a power struggle arose between Edward's younger brother, Richard, Duke of Gloucester, who had been appointed Lord Protector in Edward's will and the Queen and her family. In April 1483, Gloucester, aided by Buckingham, siezed control of the young King Edward V at Stony Stratford, whilst he was progressing to London from Ludlow. Richard arrested Edward V's maternal uncle, Antony Woodville, Earl Rivers, and half-brother, Lord Richard Grey both of whom were later the executed. The Queen was persuaded by Buckingham to allow his younger brother, Richard, Duke of York, to accompany the young king in the Tower of London, ostensibly to await his coronation. After gaining control of the Duke of York, Richard denounced the two 'Princes in the Tower' as bastards and took the throne for himself as King Richard III. Buckingham served as chamberlain at Richard's coronation and played a prominent role the lead up to the deposition of the young Edward V, on the 24th of June 1483 he urged the citizens at the Guildhall to take Richard as king, Thomas More later stated "for he was neither unlearned and of nature marvellously well spoken"
Buckingham's motives in supporting Richard's coup d'état seem to be his resentment of his 'low-born' Woodville in-laws and their influence and his interest in the de Bohun estate. 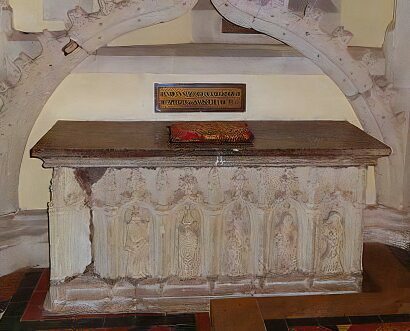 He had inherited property from his great-great-grandmother, Eleanor de Bohun, who was the wife of Thomas of Woodstock and the daughter of Humphrey de Bohun, Earl of Hereford. Eleanor's younger sister and co-heir Mary de Bohun married Henry Bolingbroke, who eventually became Henry IV, and her share of the de Bohun estates became incorporated into the holdings of the House of Lancaster. When King Henry VI was deposed by Edward IV, he appropriated those lands into the Crown property. Humphrey's grandson Henry Stafford, 2nd Duke of Buckingham, claimed the de Bohun lands should have devolved to him. Buckingham was rewarded for his support by Richard III, by being granted these lands, pending the approval of Parliament. He was also given the offices of Justiciar and Chamberlain of North and South Wales, and Constable of all the royal castles in Wales and the Welsh Marches. Edward IV's disaffected supporters plotted a rebellion against Richard III in 1483. For reasons unknown, Buckingham entered into the conspiracy and in early in August, withdrew from Richard's court to Brecon, where he came under the influence of his prisoner, John Morton, Bishop of Ely. He may have felt he had not been richly enough rewaeded for his part in Richard's usurpation. The plot was originally aimed at restoring Edward V to the throne, but when rumours arose that Edward and his brother were dead, it was instead proposed that the Lancastrian claimant Henry Tudor then in exile, should take the throne and marry Edward's eldest daughter, Elizabeth of York. If Richard III was responsible for the murder of his nephews, the Princes in the Tower, these murders may have resulted in Buckingham's switching sides. However, Buckingham himself may have possessed motives to kill the Princes, having a claim of his own to the throne which, it could be argued, was more legitimate than that of Henry Tudor. According to a manuscript discovered in the early 1980s in the College of Arms collection, the Princes were murdered "be [by] the vise" of the Duke of Buckingham. There is some debate over whether "vise" is meant as "advice" or "devise". On the 15th of October, Richard III, being fore warned of Buckingham's defection issued a proclamation against him. Buckingham gathered an army from his estates in Wales and the Marches and rose in rebellion, Henry Tudor, however, failed to land as his ships ran into a storm and were forced to return to Brittany. Buckingham's advance was halted by a flood on the River Severn and his army deserted in large numbers as Richard's forces approached them. Buckingham attempted to escape in disguise and sought Sanctuary at the Abbey of Beaulieu in the New Forest but Buckingham was turned in for the bounty Richard had placed on his head.He was betrayed by his follower, Ralph Bannister, and brought to Richard at Salisbury. Despite his pleas, the king refused to see him, and after a summary trial he was convicted of treason. Buckingham was beheaded in Salisbury following day, 2nd of November 1483. His widow, Catherine Woodville was later married to Henry Tudor's uncle, Jasper Tudor. 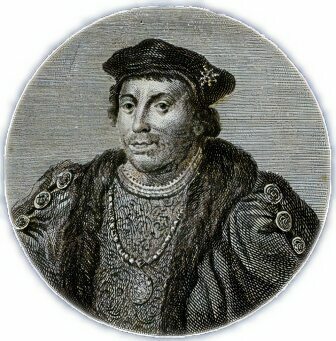 Buckingham's eldest son, Edward Stafford (1478-1521), eventually succeeded him as Duke, his attainder was removed in 1485. He was was executed for treason by Henry VIII in 1521.